Braids and rains. As lovely as the combinations sounds with word play, both don’t do well together, because of the effect rainwater has on hair extensions. 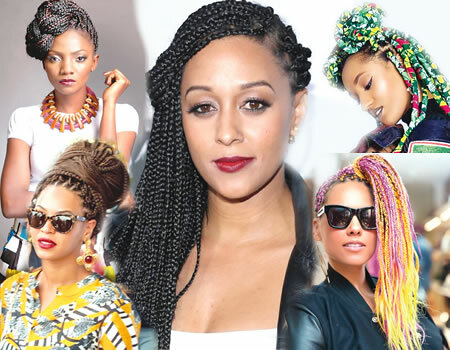 However, the rainy season is no excuse not to rock braids – the reference here is boxbraids. The hairstyle is not only versatile in terms of creativity, you also get growth and low-cost maintenance tips as a plus. Makeover shares tips for looking beautiful with box braids this wet season. Although hair extensions have increased by more than double their prices, with corresponding decrease in volume per pack, box braids and its counterparts are still quite affordable, as long as your stylist is on the expert side of skills. With other styles, when they get wet, there is the risk that the style is ruined and may need to come off. For braids, the story is different. Depending on how wet it is, all you may need to do is visit your stylist for a simple wash-dry-oil treatment. Your braids will look as good as new. To prevent unnecessary water getting into the hair, keep your bag close and your shower cap closer. There is a reason shower caps are easy to deflate and can fit into almost any purse size. The important thing is to always invest in quality. After each use, do a simple rinse out, dry and replace in your bag immediately. Unlike hairstyles where every morning is a compulsory routine of detangling, brushing, combing and styling, boxbraids bring your creativity to light. Without the need for detangling, brushing or combing, your braids would look just as beautiful whether styled up or let down. See (website address) for tips on styling boxbraids. Whether your hair is natural or retouched, you have a place in the warm embrace of the box braids’ family. And as a plus, however long you decide to carry braids, you will definitely see a positive difference in length.